But Assyrians Are Not Arab! Never Like It in The Middle East! I Tell You; We're Not Arabs! After spending only a few months as a volunteer on an Assyrian civic, political, or church committee one can quickly recognize the need for an effective administrative and financial mechanism. Soon many of us become disillusioned by internal bickering and lack of continued business success. A successful project requires "long-term planning", a concept non-existent in the Assyrian dictionary of project management. We're not alone! This is also true with other ethnic and religious minority groups who wander around the world without a permanent resting place. Our actions and decisions are the result of our attitudes toward our environment. For a very long time we have been forced to accept the fact that nothing, including our existence, has a permanent status and our actions have been carried out in reaction to our ever-changing milieu. An example of this debilitating state of mind is the current situation in North Iraq. As was stated in Zinda Magazine's recently produced video, "Assyrians of North Iraq After the Gulf War", Assyrians in the north are fearful of the day when Saddam Hussein will move his troops into the Safe Haven. While they continue to build new schools and other structures, there may be an unspoken feeling among the local activists about the impermanence of their struggle carried out every hour of their short-lived existence. If given the opportunity, most of our sisters and brethren in the North would purchase a one-way ticket to Turlock or Toronto. How do we then switch from our "nomadic" style of decision-making and organization to a more stable form of existence? First, we must realize that three phases of existence follow every major life-threatening event: first we fight back, we then try to survive in our new environment and after gaining a control of the situation begin to influence it. Historically we have never been able to successfully initiate the last phase. Let's take the Seyfo Genocide as an example. In 1915 a series of massacres were carried by the Ottoman Empire (today's Turkey) against its Christian citizens (Assyrians, Armenians, and the Greeks). Assyrians faught a good fight and won some battles in Persia. The Russians and the British left them to their own devices and so they began to escape the enemy (survival) by taking the long journey from Urmia to Bakuba, Iraq. The stabilization phase continued from late 1930's (after the Semel Massacres) through early 1970's. Only when there were talks of "political negotiations" with the governments in Tehran, Baghdad, and Beirut between 1969 and 1974-- once again Assyrians had to flee their homes again in the late 1970's. Living in the west we must now successfully carry out the Third Phase. All of us are fed up with the ineffectiveness of our political leadership and the impermanence of their objectives. But instead of pointing fingers at them WE must begin to sort through our priorities and implement a long-term plan to build a stable framework for economic power and political influence. Zinda Magazine believes that popular support for such a view is certain; however, the masses lack trust in current leadership and are hostile toward any new ideas from the "Congresses", "Alliances", or "Democratic" this or that. Our political entities have done more to undermine our efforts than to defend them. The bravest act of protest carried out by any one of them are the weekly press releases they fax to government agencies around the world. Then who shall speak for the people? The people shall, says Zinda Magazine. People must become committed to the re-building of the Assyrian nation in all its colorful ethnic, religious, and social flavors. Technology advances now can help us carry out the Third Phase. But first the people must demonstrate a desire for change. On November 5, Zinda Magazine will outline a new program for the implementation of the Third Phase. This, we believe, will be the largest undertaking of its kind in our modern history. Zinda Magazine believes that the PEOPLE, not the so-called leaders, know best what serves the interests of our nation. The general will of the Assyrian people must then be directed toward a common objective and carried out to the end. In the next few weeks the general premises of this new program will be discussed in this column. Altering the incapacitating psyche of our conscience begins with the first step toward the completion of a long-term plan that we have never traveled together. We have a historic opportunity, in light of the recent world events, to realize our 100-year old vision. With the aid of modern technology it is now possible to imagine the unimaginable. So long as we desire the endurance of our Assyrian heritage, language, identity, and faith; and are acutely aware of our fragile existence here and in the Middle East, then any common efforts to construct a new framework for economic and political strength must be explored. The risks may be great, but not greater than not initiating the Third Phase. Our time has finally come! The city of Aleppo in Syria is one of Middle East's most ancient cities dating back to 2000 B.C. The Assyrians invaded Aleppo in the 9th century B.C. It rose to prominence again as it became a center of commerce after the death of Alexander the Great in 330 B.C. The Moslem invaders conquered Aleppo which they called Halab in 636. Most of Aleppo's population at this time was Christian and would remain the same way for many centuries later. Soon Aleppo became an arena of strife and political maneuvering between the Moslem and Byzantine rulers. During the Crusades, Imad al-Din Zangi - governor or Aleppo and Mosul (1087-1146) - attacked the city of Urhai (Edessa). This was the first Christian city to fall to Moslem reconquest. It enjoyed a time of peace during the Ayyubid rule in the 13th century. Its famous citadel was repaired during this time and several famous schools and a hospital were constructed. The Mongols attacked Aleppo in 1260, ending the era of peace and the citadel was once again destroyed. 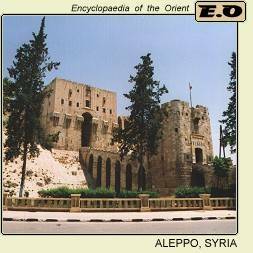 Between the 16th and 17th centuries, Aleppo became a vital trade center for the Ottoman Empire. Venetian, French, British, and Dutch consulates established trade stations here. The growing prosperity of the Christians in Aleppo, because of their ties to European traders, was being resented by the Moslems. Beginning in 1839 the new Ottoman Empire's new bureaucratic and military establishment known as Tanzimat hoped to strengthen Turkey against the European influence. To accomplish this, Ottomans set up new administrative regulations reformed military practices, promulgated new laws, and established schools and communication means based on European models. Tanzimat also improved Christians' standing by declaring legal equality for all subjects regardless of their religion. Moslems in Syria believed that the Ottomans were favoring the Christians in order to appease the Europeans. In 1850 the Ottoman authorities had recently completed the first census on Aleppo's adult males and there was widespread apprehension that a broad conscription would follow. A crowd of Muslims gathered before the governor's building to protest, but the governor refused to deal with them. On 17-18 October 1850, Muslim crowds attacked Judayda, a prosperous Christian suburb of Aleppo. There the mob entered homes and churches, plundered and looted, and murdered many Christians. As word of the atrocities spread, Christians living in other quarters took refuge in the homes of Muslim neighbors and in the commercial district. On 19 October, the leader of the local servicemen headed off further violence by promising to present the Ottoman governor with the crowd's demands, including a promise not to carry out conscription and to prohibit public processions by Christians. After the August 1933 massacres in north Iraq, over 9,000 Assyrians fled into Syria and settled along the Khabour River in the Jazira Province. For 8 years the League of Nations operated a special administration to assist their settlement and economic integration. 10 percent of Syria's population is Christian today. With a population of over two million, Alepp remains the cultural and commercial center of northern Syria and home to a large Christian minority. This week Syria, a country on the U.S. list of states sponsoring terrorism, was elected to a seat on the prestigious 15-nation United Nations Security Council. Syria's presence on the Council gives it access to all council deliberations, including a new British-led committee which will enforce counterterrorism measures. Yesterday Syria blamed Israel for the escalation of world terrorism. The official Syrian daily newspaper Tishreen said in September that attacks on the United States were a result of what it called Israeli terrorist actions against Arabs. (ZNDA: Dohuk) Last week the Patriotic Union of Kurdistan's Military Command issued a statement of its successful campaign against the Kurdish Islamic group called Jund al-Islam in its North-Eastern Bet-Nahrain territories. It was reported that Hiwa Keyor, a top Jund Al-Islam commander and suspected assassin of the Assyrian Governor of Arbil, Franso Hariri. Mr. Hariri was gunned down on 8 February 2001. Hiwa Keyor was killed along with nearly 40 other Jund Al-Islam terrorists near Halabja, in North Iraq. The Jund al-Islam is reportedly linked to Osama bin Laden's terrorist networks. The Iraqi National Congress has already linked Osama Bin Laden to the government in Baghdad in a press release this month. It stated that in December 1998 Faruq Hijazi, a senior Iraqi intelligence official, visited Bin Laden in Afghanistan, accompanied by Iraqi intelligence officers. Hijazi is Iraq's ambassador in Turkey and has served as head of the foreign covert operations division of the Mukhabarat. According to the same report, noted in a recent Radio Free Europe article by Mr. David Nisman, Muhammad Atta --one of the terrorists involved in the World Trade Center event on 11 September-- met an Iraqi intelligence official in Prague. The official is known to be a close associate with Hijazi. Massoud Barazani's Kurdistan Democratic Party has also promised financial, material, and military help to the PUK in the fight against the extremist Muslim group. A week prior to this new development between the two historically rival Kurdish political groups (PUK & KDP) the Jund al-Islam beheaded and then mutilated several PUK Pishmargas. The Patriotic Union links the Jund al-Islam to Osama bin Laden and says some of its fighters were trained at camps in Afghanistan. Barham Salih, prime minister of the PUK-controlled region in Iraqi Kurdistan, met in Ankara with Turkish Foreign Ministry officials on the recent clashes between PUK troops and the Jund Al-Islam. He is now in Washington D.C. to meet with the U.S. officials this week. He will be joining KDP's Hoshyar Zebari in a meeting with the State Department and other officials this week. A delegation from the Assyrian Democratic Movement, Assyrian Universal Alliance, Assyrian Democratic Organization, Bet-Nahrain Democratic Party, and the Assyrian American National Federation will also visit Washington later this week to meet with U.S. State Department officials and other government officials to review the recent developments in the region. Bilateral discussions between the Kurdish groups and the Assyrian delegations are also expected in Washington at the same time. (ZNDA: Tehran) An initiative by President Mohammad Khatami to telephone Pope John Paul II underscored Iran's strong desire to ensure the terrorism crisis does not degenerate into a clash between Christianity and Islam, analysts said last Thursday. "We hope that in the near future, the world will no longer know war and poverty, but peace and goodness," Khatami said during the Wednesday night conversation, which marked the first time a leader of the Islamic republic has telephoned a pontiff. Khatami, himself a mid-ranking Islamic cleric, once again condemned the September 11 "massacres" in the United States, adding they demonstrated "the decline in spirituality and morality" in the world, local media reported. Khatami -- the leading force behind 2001 being declared by the United Nations as the year of "Dialogue among Civilizations " -- also said there was a need for "collaboration between Islam and Christianity to save humans and establish a real peace in the world." Pope John Paul, cited by Iranian television, answered that: "Cooperation is needed between the different religions, notably Christians and Muslims." This kind of dialogue between the pope and Muslim leaders like Khatami is "very important," Bishop Ramsi Gramoi of Iran's 15,000-strong Assyrian-Chaldean community. "We even hope it can prevent war," he said. "Sincere discussions between Christians and Muslims can have good consequences. The two religions together group almost half of humanity." Around 99 percent of Iran's 65 million people are Muslim, but it also counts around 250,000 Christians, 30,000 Jews and 30,000 Zoroastrians. (ZNDA: Chicago) Three Assyrian men are suing United Airlines for allegedly being kicked off a Phoenix-to-Chicago flight, four days after the Sept. 11 terrorist attacks, because a passenger erroneously believed they were Arabs and posed a danger--even after the men were cleared by the FBI and security. Younadam Youkhana, 52, and his son, Ninos, 20, who are in the parking lot business in Chicago and who are American citizens, were on the flight along with two Iraqi friends, one of whom is also a plaintiff in the suit. The Youkhanas and their guest, Mr Sami Shlimon, 31, the head of the Assyrian Students Union in Dohuk, North Iraq, filed suit Wednesday against United, charging discrimination. The Youkhanas and Shlimon, who had attended fund-raisers for the Assyrian Democratic Movement, went through security without a problem in Phoenix, according to their attorney, Terence Moran. They took their seats on board, but after a 40-minute wait, everyone was told to get off for a mechanical problem. After a fellow passenger pointed the men out, Moran said, officials from the FBI, the Federal Aviation Administration and police escorted them to an office. They consented to a pat-down search, a search of their bags, and an explosives test on their checked luggage, as well as a background check of their identification. The men did not object to the investigation, following four fatal hijackings Sept. 11. "They realize the times we're living in, and that the FBI needed to check it out," Moran said. The FBI informed a United agent the men were cleared of suspicion. But the United agent at 2:40 p.m. told the men they couldn't get on Flight 722, Moran said, because a female passenger was uncomfortable with them and the pilot didn't want them on board. Instead, they had to wait for the next flight home. "They chose to bar our clients because of suspicions based on the way they looked and sounded," Moran said. The plaintiffs seek unspecified financial compensation, but not millions of dollars, Moran said. They want United to admit it behaved unlawfully and to put in place procedures to make sure the same thing doesn't happen again. (ZNDA: Sydney) According to a report from the SBS Assyrian-Australian radio program, one of the eight captured human rights workers in Afghanistan is a 52-year-old Assyrian woman from Australia. 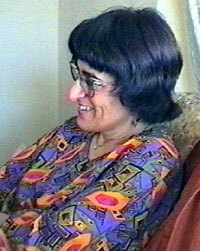 Diana Thomas was arrested on August 5, along with -- two Americans, one Australian and four Germans by the ruling Taliban on charges of promoting Christianity. Ms. Thomas is a member of the German charitable organization called Shelter Germany. Diana's uncle, Mr. Nimrod Thomas, explained in a September 28 interview with Mr. Wilson Younan of SBS Radio that his niece is "not being ill-treated" and is waiting for an Afghani lawyer to help her with the trial. The American Jesse Jackson had earlier indicated a desire to negotiate the release of the 8 Christian workers. The fate of Diana and the other seven international workers is now less certain after the commencement of attacks on Afghanistan earlier this week. (ZNDA: Hartford) Paul Frederic Simoni, 61, of Wethersfield, Connecticut passed away on 2 October 2 at Hartford Hospital. Mr. Simoni was born in Palo Alto, California and was the son of the late Guido and Beaulah Simoni. He was predeceased by his beloved wife Marilyn (Timmins) Simoni (June 8, 2001). Paul received a bachelors degree from San Jose State University in 1968 and a Masters in Social Work from the University of Connecticut in 1971. He served in the United States Navy from 1958 to 1962. Paul had a career as a social worker in private practice since 1974. He was also employed as a crisis counselor at Middlesex Hospital since 1999. As a member of Sacred Heart Church in Wethersfield, he was a director of their youth group. He is survived by his daughters and a son-in- law; JoLynn and Gregory Sargis of Hartford and Cheryl of Florence, Massachusetts; sons, Christopher of Ventura, California and Justin of Boulder, Colorado; his beloved twin granddaughters; Rachel and Kaitlyn Sargis; his brother and sister-in-law, Donald and Barbara Simoni of Los Altos, CA; his sister-in-law, Ellen Simoni of Punta Gorda, Florida; his in-laws, John and Esther Timmins of Wethersfield and many nieces and nephews. He was predeceased by his brother, Richard Simoni. Paul will be remembered for his love of sailing, running, cooking, playing with his granddaughters and spending time with his family and friends. A memorial service will be held on Wednesday, October 10, at 10 a.m. in Sacred Heart Church, 56 Hartford Ave., Wethersfield. The family will greet friends in the church hall following the service. The family would like to thank the staffs at the Palliative Care Unit at Hartford Hospital and at the Connecticut Visiting Nurses Association for their compassion and wonderful care. Donations in Mr. Simoni's memory may be made to; Mikey's Place, c/o Mary and Dan Daversa, 92 Chamberlain Rd., Wethersfield, CT 06109. Farley-Sullivan Funeral Home, 34 Beaver Rd., Wethersfield has care of the arrangements. I just read the October 1st installment of your Magazine. I feel outraged that a reputable magazine such as Time would post such false and uneducated things about us Assyrians by calling us Arabs? I felt so outraged I sent a letter to the editor and let him know we're a separate culture from Arabs. Set up a e-petition list or something so we can have Time Magazine apologize to us. This shouldn't go unpunished!!!" Assyrians and Chaldeans are not Arabs. We speak a completely different language, Arabs speak Arabic and Assyrians speak Assyrian (known in the west as "Aramaic" or "Syriac") Arabic is DERIVED from Assyrian not vice-versa!!! Our culture is also a lot older than the Arab culture as well. If being Arab constitutes living in the middle east then why don't you call the Jews, Kurds, Armenians, and the many other minorities as "Arabs"? The information given to you by the Arabs is completely false... I think an apology to the Assyrians and Chaldeans is required here - I consider it a disgrace to be called an "Arab" when I know very well I'm an Assyrian. This sort of ethnic amalgamation of my people is no different from what the Iraqi and Turkish governments are practicing today. My people have been struggling for western recognition since the genocide of my people during WW1. Please make mention of the Assyrians as not being Arab in a future issue; there are about 4 million of us worldwide, not including the Chaldeans. Again, we are a COMPLETELY separate race!!! Please take the time to look into my people and culture, you'll find some very interesting things. for more info on my people. "You wrote that Assyrians are being identified as Arabs in several major American media sources and the Arab American Institute in Washington. It is strange that the Arab American Institute whose title pretends to symbolize the ethnology science declares such wrong assertions. I respect Arab and other nations, but Assyrians are not Arabs or Jews, are not Ukrainians or Englishmen, are not Indians or Chinese and so on. Ancestors of Assyrians already lived in Mesopotamia more than 50 centuries ago, while Arabs came there only in the 7-th century A.D. And Assyrians were not assimilated by Arabs because they had adopted the Christianity half a millennium before the Arab invasion and keep it up to now. I think that Assyrians in USA could demonstrate no reaction to the mentioned assertions, if not an ominous context of the great September tragedy. Perhaps identifying Assyrians with Arabs nowadays peruses the attempts to link Assyrians with Muslim terrorists in minds of peoples. There is nothing more erroneous and unjust in the world than such attempts. Along centuries Assyrians themselves suffered from Muslim terrorists, and during the genocide of 1915 - 1918 half of Assyrian nation was murdered by them (including both of my grandfathers). The whole 20-th century is marked by terror against Assyrians in certain countries of the Middle East. It is why Assyrians lost most of their primordial native lands and are dispersed all over the world. Assyrians are bearers of the most ancient at the globe direct civilization tradition." "I, am Assyrian and I will live with pride as Assyrian American, loyal to this great country as I always been in any adopted country. This great country gave us our dignity back and we are treated as humans again and free like every body else to live in America. I am sure that Arabs in America understand this too, otherwise they wouldn't be here. Three weeks ago watching television during a mass held in a church for the victims of the World Trade Center, I noticed the presence of the former U.S. presidents -- Ford, Carter, Bush (Senior) and Clinton. I am sure President Reagan would have been there too had he not been sick. Now just imagine that in the Arab world! What former president, even previous high official Arab is still living? Please ask those who classify Assyrian as Arab, do you know this much about history of the Middle East? Or because you ran away from a master you still think like him; looking at the planet earth and saying: This is the Middle East- Arabs only." "We are cordially with you in this misfortune. I learnt with much sorrow that you were victims of attacks coming on behalf of some Americans who assimilated you to Arabs. I am offended to learn that one burned an Assyrian church in Chigaco. I am a professor, graduate in Civilizations. I tell you; We are not Arabs, but we are Assyrians, going down from ancient Assyria and Chaldea. Our ancestors lived in Mesopotamia and Syria of the North, several centuries before the arrival of the Arabs in VII-th century. We are a different people , with a Syriac culture, Aramean language, a religion, Christianity, and own history. We respect the Arabs, we had many good relations with them during the last centuries, but we confirm our different, ethnic, religious, and cultural identity." Attention was brought to my eyes in regards of the "As American As" article by David van Biema (October 1st issue) with the Arab American Institute stating that Assyrians and Chaldeans are Christian-Arabs. That is a great inaccuracy on their part and although it might not have been intentional, it was bothersome nonetheless. Modern day Assyrians and Chaldeans (the Assyrio-Babylonian population) are direct descendants of the indigenous population of Ancient Mesopotamia (Bet Nahrain in Aramaic). The US Census divided us this time around by religious subgroups of Assyrian/Chaldean/Syriac because of church divisions between Nestorians (Assyrians), Eastern Catholics (Chaldeans) and Eastern Orthodox (Sryiacs). Those divisions were based on Northern, Eastern, Southern and Western dialects as well, all of which speak a form of Aramaic, the language that Christ spoke as he walked the earth 2000 years ago. The only religious divisions we have among the Assyrio-Babylonian population is that of which Christian sect we belong to. We are just as dispersed as our Semitic brethren the Jews. We have populations not only in Iraq (Bet Nahrain) but to where the ancient empire had extended to and beyond. Those places would be Iran (a non-Arabic speaking nation in the Middle East), Syria, Lebanon and Turkey (a non-Arabic speaking nation in the Middle East). We also have a large population in Russia, Germany and Sweden, not to forget the United States and Australia. Yes, a majority of us do speak Arabic because that is the language of the governing land. We have kept our cultural and our language for 6751 years of recorded history (Assyrian New Years, the first harvest of Spring April 1 through the 12). This is also something that has troubled us in studying the history of Mesopotamia in that it has been divided into Akkad, Sumer, Babylon, Assyria, etc. Which is true that these were all city-states at one time, but were eventually united by the Northern Kingdom (Assyria) and then switched hands by the Southern Kingdom (Babylon) all of which were the same ethnic people. This has also been troublesome in studying our Orthodox brethren in Greece, since the newer Western Civilizations tend to have united them as one nation. That was not the case until Alexander the Great of Macedonia came to power. Greece was always divided from Athens and Sparta as well as other city-state societies. They had their unified language as well has different dialects, as do we. The Assyrio-Babylonian population speaks Aramaic, the predecessor to Hebrew and Arabic. The Father of Monotheism, Abraham, came from Ur, a Mesopotamian city-state as he was called out by God to deliver his people. The entire Hebrew alphabet is identical to ours except for calligraphy (font style). The Arabic language uses more than half of our written characters. My question to you and to the Arab American Institute is that how can the son become greater than the father? Meaning that, if Assyrians and Aramaic came first how can we now be a subgroup of a people that came after us? My loyalties are to my Lord and Savior, the land that feeds me and the culture I was brought up in. I will not deny my identity nor will I assimilate out of fear, discrimination or intimidation. I was born in the United States, I will die in the United States, and from my first breath to my last wheeze I shall always be an Assyrian-American. New York may be Ground Zero for the World Trade Center (WTC) victims, but I live at Ground Zero for those who aid and abet the perpetrators. Southeastern Michigan is home to the largest concentration of Arabs outside the Middle East. It's insulting for peaceful, tolerant Americans to hear every news anchor and even President Bush call for them not to physically attack Arab-Americans. While we've heard trumped up complaints that they've been harassed over the past few days, it's the exact opposite. As an attorney who has successfully represented Arab-Americans in civil rights cases, it's my view we've been far too tolerant. To be sure, most Arab- and Muslim-Americans are decent, hard-working, law-abiding Americans who want strong national security. Fouad Ajami of Johns Hopkins University and WND.com Editor in Chief Joseph Farah - who regularly risk their lives to expose terrorism and hatred in the Middle East, as did the late Seifeldin Ashmawy - make me extra proud to be an American. I take pride in patriotic Cleveland Browns fullback, Tarek Saleh, and moderate, tolerant Islamic leader W. Deen Mohammed. And, besides those who died or were injured and their family and friends, my heart most goes out to the over 250,000 Chaldean- and Assyrian-Americans who live here. A Catholic minority primarily from Iraq, they were persecuted by Saddam Hussein, and now, their numbers are shamelessly claimed by Arab groups with whom they don't identify, for political and financial gain. Chaldeans are among the most patriotic, decent Americans I know. Now, because they have Middle Eastern looks and names, some may be wrongfully blamed. But then there are those Arab- and Muslim-American leaders that allow terrorists from their communities to flourish in this country and actively defend them. They oppose reasonable measures to prevent terrorism here and support those living here that are suspected of committing and/or facilitating it. Arab and Muslim leaders, like Arab American Institute head Jim Zogby and Arab-American News publisher Osama Siblani, actively oppose the use of secret evidence and racial profiling for terrorists. Secret evidence, intelligence from agents abroad about individuals' involvement with terrorist groups, is the strongest counter-terrorism tool we have in matters involving the entry into the U.S. of potential terrorists. The evidence cannot be revealed because it will compromise U.S. foreign intelligence gathering and result in the certain death of our agents. But thanks to the pressure of the Arab community, it is rarely successfully used, and federal agents are crippled without it. President Bush kowtowed to the Arab community here and then-senator and now Energy Secretary Spencer Abraham, an Arab American, campaigning against both secret evidence and racial profiling of Arabs. "The present administration has pursued policies that, in practice, have adversely affected your community," Bush said in a campaign video to Arab-Americans regarding secret evidence and profiling, according to The New Republic. Once in office, in his first address to a joint session of Congress, Bush spoke about ending the practices, and in February, he issued a directive to Attorney General Ashcroft, ordering him to "work in cooperation with state and local law enforcement in order to assess the extent and nature of any such practices." With secret evidence and profiling in place, we could have prevented many of Tuesday's terrorists from entering the U.S. But Arab American leaders actively defend and support many suspected terrorists, primarily Muslims, who are charged as terrorists by INS officials. But even without profiling, Arab-American leaders dismiss even the strongest cases against Arab-American terrorists with the convenient "profiling" label. In November, the FBI's joint counter-terrorism unit and U.S. Customs agents caught Arab-American brothers, Ali and Mike Boumelhem, trying to ship weapons and weapons parts to Hezbollah terrorists in Lebanon, intercepting them at the Ambassador Bridge to Canada. In 1982, Hezbollah killed 240 U.S. Marines in Lebanon. Hezbollah also tortured, murdered and hung the body of U.S. military attaché Col. Higgins on display. Ditto with the U.S. Embassy in Lebanon's CIA Agent Butler. But U.S. District Judge George Caram Steeh, an Arab American, ordered Mike Boumelhem released on an unsecured bond and dismissed two counts in the indictment, because a witness recanted. And rather than hailing this anti-terrorism success by law enforcement, the bust - the culmination of tips from FBI-informants and an extensive nine-month investigation - was quickly attacked by Arab leaders Siblani and Adrian Baydoun, as profiling. Siblani's wife, M. Kay Siblani, also an officer of his Arab American News, is an official of the Council on American Islamic Relations, a group that actively defends Arab terrorist groups, Hamas, Hezbollah, and others that kill Americans. In 1997, Detroit Arab leaders objected to the official release of the State Department list of terrorist groups. Siblani told the Detroit Free Press that Hezbollah does "wonders for the Lebanese." American-Arab Anti-Discrimination Committee legal director Houeida Saad announced the group was preparing legal challenges to antiterrorism laws that prohibited donations to terrorist groups. Ismael Ahmed, executive director of the Arab Community Center for Economic and Social Services said it would be hard to find Arab Americans who didn't support at least one of the groups. In June 2000, Arab American leaders objected to most proposals of the National Commission on Terrorism, including monitoring of foreign students, fund-raising in the U.S. by terrorist groups, and involvement of the military in domestic terrorism cases, according to the Detroit Free Press. Imad Hamad, regional director for the ADC, who objected to the anti-terrorism measures, was a suspected terrorist the INS wanted to deport, but is now a U.S. citizen, thanks to Arab-American political pressure against the use of secret evidence. Don't blame federal agents for Tuesday's lapse in national security. Blame my neighbors - the Arab American and Muslim leaders who've actively blocked the fight against terrorism for years. Situation in North West Persia.- On the 6th March Sir C. Marling reported [No. 186.] the capture by Jangalis of the British vice-consul at Resht. The fact, he said, seemed certain, though he could get no direct news and the French consul had been instructed to take charge of British interests. On the following day he reported further that the vice-consul and the manager of the Imperial Bank of Persia had been taken to Kasma; the Government had informed him as to this and had expressed its regret, aiding that it was trying to procure their release. Telegraphing again on the 10th [No. 2ot], he said that in a letter from Kuchik Khan [?to Obeidulla] it was stated that the captives would be detained till Suleiman Mirza was released. In regard to the disturbance at Tabriz mentioned in last week's report [p. 6], Sir C. Marling, telegraphing on the 7th March [No. 188], said that on that occasion the Syrians had been guilty of many excesses; they had got the upper hand, and in com-pliance with their orders the Moslems were being disarmed. It was feared that the truce was only temporary. His information came from the American consul, who also said that 100 Syrians and several hundred Moslems had been killed. (1) that the acting consul at Tabriz had reported that the Democrats were becoming more anti more menacing towards tee British ; (2) that information had been received of the seizure of Ardebil by the Jangalis; and (~3) that the situation at Kasviu was somewhat disquieting. On the 10th he also reported [No. 202] that the following had been received from Hamadan :-"Famine increasing; starving villagers flock to (?town) ; starving people useful to Extremists. If we (?assisted) we should have whole of the people on our side. About 100,00 necessary to support populace till harvest." The Shah-Telegraphing on the 27th March [No. 254], Sir C. Marling said that the Shah was firmly resolved to remain neutral if it was possible for him to do so; our troops were distant, and he was much impressed by the telegrams from the Sultan and the German Emperor, both of whom guaranteed the absolute independence of Persia and its unconditional integrity. Urumia.-Sir C. Marling telegraphed on the 31st March [No. 268j saying that the consul at Tabriz had reported the arrival of three persons from Urumia, who had stated that, in consequence of the murder of the patriarch Mar Simon, the Syrian Christians had risen and massacred all the Moslems they could find, and had then gone, with ten cannon, towards Dilman to attack the Moslem villages. The town was being policed by the Armenians, who had tried to separate the combatants. Twenty of the more notable Moslems were held as hostages in the house of the Russian general who com-manded the Syrian formations, and 500 others had taken refuge in the French military hospital. Request for Financial Help for the Jelus.--Sir C. Marling telegraphed on the 9th April [No. 288] asking for instructions in regard to an application which had been made through the Russian consulate-general in Tabriz to His Majesty's consul in that place. There was a force at Urumia known as the Jelus, consisting, of Nestorian levies, commanded by a Russian officer who had stated that the, ammunition of this force was almost exhausted and the force itself impaired, so that it would be obliged to return to Van unless it received 100,000 tomans. This force was brought into Persia when the Russian troops were withdrawn, it having been originally raised in Turkey. Were it withdrawn, the safety of the Christian population of Urumia and the adjacent districts would be endangered, as the battalion which attacked the Persian Cossacks near Urumia, and had committed other excesses, especially since the murder of Mar Shimun, was a similar formation, if, indeed, it did not actually form part of the force in question. Sir C. Marling therefore thought that the supplying of the cash asked for was a necessity; there was more than sufficient lying in the Imperial Bank of Persia at Tabriz, but without. the real co-operation of the Persian Government it would be practically impossible to send so large a sum from that place to Urumia, and the one wish of the Government was to bring about the withdrawal of the Jelus. The consul at Tabriz had been confidentially informed that the Tiflis staff had decided to disband the force; but he was not satisfied as to whether it would obey such orders or permit its Russian officers to leave; the commander's idea, however, seemed to be that if he could get money he and his officers might escape. In their own mountains the Jelus were good fighters) but they were quite undisciplined; and they would probably make their way back to the Julamerk districts and, as in the past, defend themselves against the Turks unless British o~1icers came to take them over, as they had been led to believe would be the case. On the 15th April Sir C. Marling telegraphed again [No. 3053 saying that the consul at Tabriz had been informed there were in the Urumia district from 2,500 to 3,000 armed Armenians. His informants were a deputation of Armenians who had called upon him, and had strongly deprecated the disarming of the Jelus, on the ground that if this were done the Moslems would have the Syrians and Armenians at their mercy. Enquiries were made by the delegation in regard to the British officers who they had been told by Captain Gracey would be sent by the Tiflis staff to drill the Jelus. When I first sat in Shoopra, a tiny Middle Eastern restaurant in the Marina, I couldn't help wonder what the space had been in a previous life. An office, maybe? A coffee shop? "A pizza place," owner Albert Youkhana told me. Youkhana remodeled it on a budget, but it's warm and inviting, despite its size and straightforward layout. One wall is sponged a rust color that matches the lace curtains on the glass doors. Another wall is a golden yellow and the back wall is a luscious mossy green. Shelves of wine and an open kitchen occupy most of the remaining wall of the simple square space. Gilded lizards and snakes adorn the walls. Oil candle sconces as well as candles set into glass mosaic holders on each table give the room a moody glow. The food is based on the cuisine of Assyria, a territory now comprised of northern and northwestern Iraq, southeastern Turkey and northeastern Syria. Customers will find some familiar Middle Eastern dishes such as fattoosh, hummus and falafel, but many others are less frequently seen. An appetizer called musta ($5), for example, consists of three balls of rich yogurt cheese -- yogurt that has been drained until it is the consistency of a creamy feta. The dish is served with triangles of pita bread and a judicious drizzle of fruity olive oil. Rizza ($4) is a celery and rice soup, similar in texture to Greek avgolemono, but with the flavor of long-cooked celery and the luscious addition of butter. Hummus ($5) comes in a shareable portion garnished with cucumbers, olives and tomatoes. The silky smooth garbanzo bean puree tastes pleasantly of tahini. Another familiar starter is fattoosh ($5), a salad of crisp romaine with tomatoes, cucumbers and toasted pita croutons in a lemony dressing. Only the fried vegetable appetizer ($4) disappointed -- but only slightly. Strips of zucchini and eggplant aren't battered before being fried so they soak up a lot of oil, but the fried tomatoes add their color and juices, giving the dish a spark. steamed chicken legs served with rice and mashed potatoes. The appearance isn't dramatic nor are the flavors intense, but it's still a homey, comforting combination. Portion sizes, however, can be inconsistent. A plate of falafel ($9) features a mere four patties of the spiced fried garbanzo bean mixture with a yogurt sauce. Cooba ($12), by comparison, comes with three portobello-size semolina dumplings filled with ground beef and herbs in a zesty tomato broth. Both are good, but when two people at the same table order these dishes, the size difference is apparent. Vegetarians have another option besides the falafel: dolmas ($11). Here boiled cabbage leaves replace the often used grape leaves and are stuffed with a delicious mixture of rice, dill and tomatoes. Desserts are limited to baklava ($5), two kinds to an order. One is pale, buttery and not too sweet, enclosing finely chopped pistachios. Youkhana tells customers, "It's the best baklava in the city." And he's not exaggerating. The other type is less satisfying, tough shredded phyllo dough enclosing a coarser mixture of nuts. The wine list here is varied as well as fairly priced, with many dishes that play well with the mild food. Customers can find the 1999 Chalone Chardonnay for $45, or budget-minded diners can opt for a 1999 Echelon Central Coast Merlot for $20. A handful of wines also are available by the glass. Service is another of the pleasures of this tiny restaurant. Youkhana treats each of his diners like p ersonal friends, but does it in a way that's not obtrusive. He keeps the tables cleared between courses, and water glasses refilled. He'll let customers linger over wine if they wish before moving on to dessert. In the end, Shoopra offers the neighborhood a place that is cozy enough for a romantic meal and equally good for a quick bite at lunch or after work. Hours: Lunch from noon-5 p.m., dinner from 5-11 p.m. daily. Beer and wine. Reservations and credit cards accepted. Street parking can be difficult. Comfortable atmosphere for Assyrian food. Good hummus, yogurt cheese, baklava. Attentive but not intrusive service. The Arabs controlled the important trade in incense and spices in southern Arabia. Assyrians were in contact with desert Arabs at this time and slowly increases their influence by intervening between rival tribes. Zangi, the Moslem governor of the Mosul district captures the Christian city of Edessa. Mar Toma Odo was born in Algosh, northern Bet-Nahrain (today's Iraq). Mar Toma is credited with the writing of the most comprehensive Assyrian dictionary and the book of grammar of the past 150 years. An accomplished theologian and poet, Mar Toma was martyred in 1918 during an attack of the Kurdish forces on Urmia, Iran.